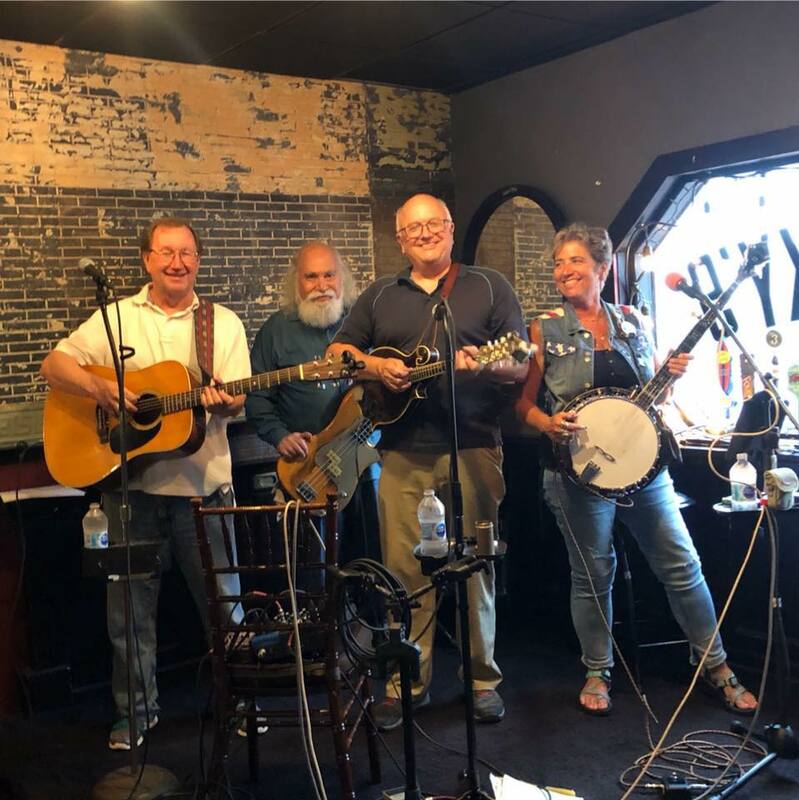 Tonight’s concert features Tookany Creek, Philadelphia’s finest bluegrass band and then some. Many miles and myriad styles and influences all combine magically in a performance by Tookany Creek. Its members, individually, have performed from Broadway to Greenwich Village, European pubs and Festivals, in fact, all over the globe. Beth Mead (banjo/vocals) Has been a faculty member of South Plains College in Levelland TX and continues to instruct there annually at their Bluegrass camp. She is the proud co-author, with celebtated banjoist Alan Munde, of Hal Leonard publication The Great American Banjo Songbook. She’s about the banjo-playingest gal you will ever hear! Larry Cohen (bass/vocals) is an extraordinarily talented musician and his bass playing is legendary. 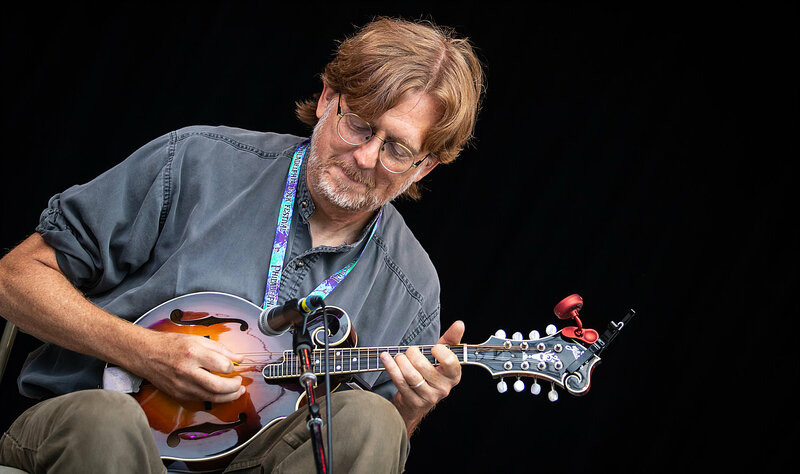 Larry has performed and recorded for years with the progressive bluegrass ensemble SKYLINE and SILK CITY and has extensively toured the US Europe and Japan and accompanied many of bluegrass’s top musicians. He teaches piano in the greater Philadelphia area. An arranger and producer, Larry has the gift of perfect pitch, so if you sing along tonight be very careful, you are being graded. Paul Kenney (guitar/vocals) No matter where Paul’s career path has landed him, be it Dallas, DC or Philly, he has always been able to add his lead vocals and powerful rhythm guitar playing to the bluegrass scene in a major way. He has performed, recorded with and travelled to Great Brittain with Virginia’s TOO FAR GONE. Paul is one of the founding members of The KING BROTHERS duet expanding in recent from bluegrass to its Celtic cousin, Irish music. Paul knows two magic tricks. John Catterall (mandolin/vocals) John began performing on banjo in 1967 as a member of the Ukrainian American String Band and stringed instruments have been a large part of his life ever since. He has performed with a number of folky duets and trios, spent over 25 years with the MOUNTAIN LAUREL BLUEGRSS BAND on banjo, and plays with Paul Kenney in The KING BROTHERS. For John, the best part of any music is the vocal harmonies, and that makes even rehearsing with TOOKANY CREEK a particular joy. John is the tallest member of the band and uses excellent grammar. Opening tonight’s concert is Russ Rentler. In 2016, Russ retired from medical practice. This has finally allowed him to pursue his life-long dream and passion of performing original and traditional music. He counts Bob Dylan, John McCutcheon and Walt Michaels as major influences in his style. His live performances are a mix of folk, celtic and blues-inspired tunes with multiple instrument changes interspersed with his off-beat humor and wry observations about life that keep the audiences coming back for more. The Perkasie Patchwork Coffeehouse is a ministry of the Perkasie Mennonite Church. The coffeehouse is warm and cozy, with lots of atmosphere. It is a place where people can enjoy fellowship and see some of the best performers available up close and personal, in an intimate setting. Perkasie Patchwork Coffeehouse is located in the church fellowship hall, which is air conditioned and handicap accessible. Admission: $12 for adults; $10 for adults 65 and over; students 13 and up, $6; 12 and under free. All ticket sales at door, no advance sales, no reservations. Delicious desserts and drinks are available. The doors open at 7:00 and performances begin at 7:30. A portion of our proceeds from each concert will go to a local or international social cause. For May our benefit supports Upper Bucks Code Blue, advocating for and providing emergency shelter and assistance to local homeless. You can also drop off donations of non-perishable food at Patchwork for Pennridge FISH (Fellowship In Serving Humanity), our local non-profit food pantry and clothing outlet here in Perkasie at all our concerts.